ORCHID ISLAND (Dan Trimmer) Tetraploid (Sdlg. X Pacific Coast) 29" EM Re. Ev. 5 ½" Now that I’m three generations into my Edge No Eye line the edges are getting bolder and the offspring more dependably edged. 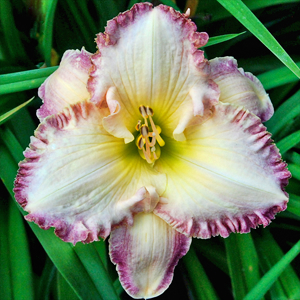 Different colored edges now abound in the seedling field. If you can imagine it, you can create it! 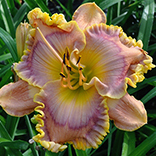 These cream blooms with the large warm lavender edge have about 30-35 blooms per scape and was one the most pod fertile daylilies I worked with last year. Another excellent grower I expect ORCHID ISLAND to thrive in the north due to its parentage.